NAMM 2014: Peavey have announced the latest evolution of their VYPYR modeling amps. Following on from the VYPYR and VYPYR VIP ranges, the VYPYR Pro uses - count 'em - four stages of Peavey's patented TransTube analog gain. The result is claimed to be the most realistic modeled distortion yet. By using analog distortion, the VYPYR Pro's digital processor has the amazing ability to offer almost limitless combinations of additional stompboxes, "rack" effects, amplifiers and now even instrument models. Because of the advanced dual processor design, the VYPYR Pro can run up to four amplifier models in parallel. Using the VYPYR Pro's unique architecture, the VYPYR is capable of designing a variety of signal path combinations. Four module bays each with their own distinct LCD can be assigned to an amplifier, effect, stompbox, or in the first position an instrument model. The modules can be assigned in any order, allowing the user the ability to create the exact rig they desire, even if they desire to run two or up to four amplifiers in parallel. With up to 5 parameters to precisely control effects, multiple delay types and advanced features such as MSDI (microphone simulated direct interface) direct output, effects loop, and MIDI control allow the professional player to create the rig of their dreams inside a single combo amplifier. AT-200™ integration is a key part of the VYPYR Pro design. The MIDI output allows the VYPYR Pro to communicate with Peaveyʼs revolutionary AT-200 guitar in order to change presets and tunings inside the guitar with one simple VYPYR Pro button press. Recording is a mainstay of the VYPYR Pro design. With the most advanced USB audio system in any VYPYR, the Pro is designed from the beginning for home recording. The VYPYR Pro also features an analog speaker and microphone simulated direct out for recording as well. With over 500 presets available and more than 100 different models of effects, reverbs, delays and amplifiers, the VYPYR Pro is the most innovative and advanced modeling amplifier on the planet. 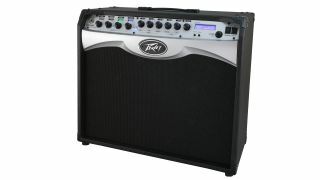 Designed for the working musician by the musicians at Peavey Electronics, it is perhaps the most versatile amp ever created. The perfect companion for the VYPYR Pro, Peavey's updated Sanpera® Pro Footcontroller unlocks all the power of the VYPYR Pro. Utilizing dual expression pedals which can be assigned to the default setting (volume on left, wah on right), or to any other stomp or effects parameter, the Sanpera Pro footcontroller is also range definable! The footcontroller also features a boost switch, tap tempo, a chromatic tuner, and looper controls that allow users to generate multi-track loops. Over 100 different amp, effect, stompbox and instrument models. Multiple delay and reverb types. Tape delay, tube delay, modulation delay, analog delay,digital delay, plate verb, room verb, cathedral verb, hall verb, tile verb, gated verb, springverb. MIDI output for connecting to the AT200-B breakout box - for changing presets on theAT-200™ guitar. Direct access to all 4 models, plus delay and reverb. MIDI output for connecting to the AT200-B breakout box - for changing presets on the AT-200™ guitar.